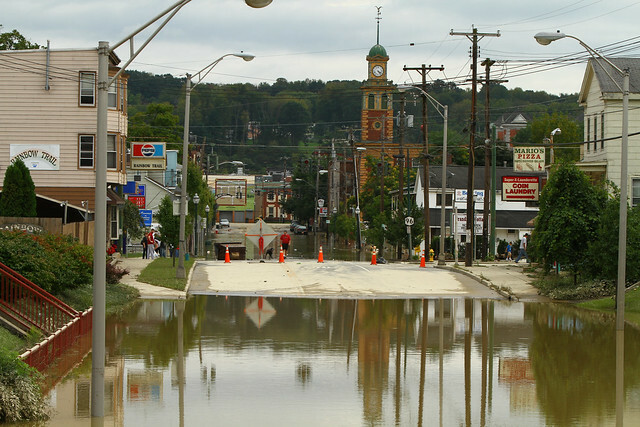 The record-setting flood of 2011 in the Southern Tier town of Owego. Photo Credit: Flickr/Chris Waits. In Pope Francis’s Laudata Si about our common home he says “our goal is to become painfully aware, to dare to turn what is happening to the world into our own personal suffering and to discover what each of us can do about it. In the Southern Tier of New York, where I grew up and where my parents still live, water is the issue causing personal suffering. The Southern Tier consists of the counties west of the Catskill Mountains. Home to the Susquehanna River, the region is known as “flood valley”. It is one of the most flood-prone watersheds in the entire country. My parents witnessed the damage from the 2006 flood and again from the record-setting flood of 2011. They helped friends clean up after much of their homes were destroyed and entire neighborhoods deemed unlivable. Companies were closed for months, some didn’t reopen and some relocated. On June 12, 2015 a thunderstorm with high winds and heavy rains hit Endwell, the hamlet in the Town of Union, located squarely in the Southern Tier. A construction mishap caused a sewer overflow and backup into 7 homes on Lyndale Drive, where my parents live. A couple days later, flash-flooding hit the region causing more destruction. My parents were up until 2 a.m. cleaning up sewer water in their basement and their neighbors had significant property damage. In thirty-one years of living there nothing like this had ever happened. Toilets and showers were like geysers, discharging sewer water and flooding basements in minutes. Dumpsters lined the driveways on the street, piled high with sewage covered couches, chairs, treasured wedding albums, carpet, sheetrock and business supplies. Like being stuck in a full porta-potty, my parent’s neighbors could not get the smell out of their noses. All of their belongings in the basement had to thrown out. Even walls, down to the studs, were pulled down. The street itself was flooded. One neighbor said she saw my dad walking up and down the street, so upset she thought he was going to have a heart attack. My dad is a first generation Sicilian-American and takes pride in his home. He is known for being extreme about staying and keeping things clean. He does not even like to get his shoes wet. He is vigilant about water conservation. If he had not previously disconnected the laundry-sink drain, the sewer backup would have been worse. It was just the concrete wall that was flooded. However, if it is allowed to remain wet, concrete can be colonized, broken down by microorganisms and contaminated by organic matter. Even though in Pope Francis’ admonishment to do something about human suffering, he cautions, “our goal is not to amass information or to satisfy our curiosity” that is exactly what I spent the next week doing. How can a disaster like this be avoided in the future and in other places? That is the question that racked my mind. Peter Knuefer, Associate Professor of Geology and Environmental Studies at Binghamton University explained to me that, “the fundamental problem for sewer backups is combined pipes for sewer and stormwater.” Intense rainfall, like that on June 12th goes into the sewer system creating pressure that becomes too much for the pipe causing backups. The pressure can be so intense, that Professor Knuefer saw manhole covers being blown off in Vestal, New York in the 2011 flood. I also reached out to Jeffrey McLaughlin, Community Relations Manager at Massachusetts Water Resources Authority. He covers Region 1, which includes Arlington, Massachusetts where I have lived since 2002. I learned a sewer backup could happen in my small apartment building at any time. Everyone has a sewer line from their property to the common line that they are responsible for maintaining and sewage can come up through any basement washer, toilet, laundry sink, or floor drain. A backflow prevention device is what stops that from happening. I read the Town of Union’s Community Plan for Recovery and Resilience, Broome County’s All Hazard Mitigation Plan, and about Broome County’s N.Y. Rising Community Reconstruction Program. I read about civic ecology, biophilia and topophilia from Cornell University’s Civic Ecology Lab and the director’s new book Civic Ecology, Adaptation and Transformation from the Ground Up. I exchanged emails with the Town of Arlington’s Engineer Wayne Chounard and finally learned that I do not have combined pipes. The storm water from Burton Street, where I live, flows into Mill Brook, Mystic Lakes, Mystic River and into Boston Harbor. I am painfully aware of what is happening to the Southern Tier. It is my hometown and where my parents currently live, so I feel deeply impacted by it. But, it is by discovering what I can do in my current home and neighborhood where I find hope and meaning. Things that I learned from my dad like avoiding putting grease down the drain, keeping hair out of the sink and bath drains and installing low-flow toilets and showerheads. Things like rain gardens and clearing stormwater drains. These are some of the things I can do in the here and now.